[this test was] considered quite independently of the influence of culture and education; and it was appreciated as the expression of an intimate, personal activity of the intelligence itself. But if one of [my students] had been subjected to the test, he would, in virtue of a long sensory training, have chosen the largest and the smallest cube very much more easily… The test would therefore have measured the different methods of education, whereas the psychical differences between the two children, really existent by reason of age or of intellectual attainment, would have remained absolutely obscure. Our society no longer trusts teachers. This has serious implications for Montessori schools. It is because teachers aren’t trusted that we subject millions of students to additional tests every year. There is a widespread perception that public education is failing. Rather than questioning how we teach, or asking if there are ways to improve our pedagogical methods, instead the blame is placed solely on the teacher. Why can’t Johnny read? The teacher is lazy or incompetent. Testing, they say, shows us which of our classrooms and schools have improved in the past year, and which are failing. If a classroom isn’t measuring up, certainly our teachers are to blame. The only explanation for children underperforming on a standardized test is that someone is not doing their job. This is like blaming the farmer for a poor harvest after a tornado followed by a drought. Few teachers enter our profession for fame or glory. Fewer still select this “easy” job so they can coast to retirement. Most teachers don their mantle out of a passionate commitment to children and education. After a few years of being treated with suspicion and forced to teach to tests, it is amazing that any public school teachers retain their passion for education. What will these standardized tests do to the Montessori classroom if we adopt them in our schools? What’s worse, the children do not benefit from these tests. They seldom if ever see the results of their standardized tests, so they cannot learn from their mistakes. Yet the consequences of their scores can have haunting repercussions. Public school students who test poorly are shunted into less challenging tracks, and are socially shamed. The curse of low-expectations has a tendency to be self-fulfilling, and Malcolm Gladwell has shown how an arbitrary assessment at a young age can painfully reduce children’s opportunities when they mature. Schools that test poorly can lose funding, see parent flight, and even be shut down. Fearing the loss of federal funding, many school districts have tied student performance to teacher pay, amplifying the pressure placed on children, teachers and administrators. There have been too many teacher cheating scandals to count, but at their root they are a lamentable yet sane response to an insane situation. You get the behavior you incentivize, not necessarily the behavior you want. If a company rewards workers for the number of widgets they produce per hour, the company will get more widgets. But the firm should not be surprised when quality goes down. Reward bank officers for the number of loans they process, and we should expect more bad loans. Tell a teenager who doesn’t care about school that she’ll get a car if she keeps her GPA up and you should prepare for the possibility that you’ll be buying a new automobile. But don’t expect her to like school, to retain anything she has learned, or to have developed any life skill more meaningful than “work hard and cram facts when you are going to be rewarded.” This is not the recipe for a life-long learner. Similarly, if you inform teachers and administrators that their compensation will be tied to how school children perform on a standardized test, then of course many will do everything they can to ensure that those test scores go up. Some of them of course will cheat. Any knowledge or skills that are not tested will be neglected or abandoned. So children in public schools are now tested constantly on the subjects that “matter”, English and those STEM subjects like math and science which are emphasized by the Race to the Top initiative and the Common Core Curriculum. In my area, in addition to the regular testing done in each classroom, children in each grade receive four to twelve additional tests, and each of these tests take most or all of a day. One 6th grader I know will take four Cognitive Assessment Tests (CATs), four Measures of Academic Progress Tests (MAPs), two practice End of Grade (EOG) tests, and two final EOG tests. Remember, these are in addition to any testing administered by the teacher. This child will be tested constantly on math and science skills. So it should be no surprise that the school’s weakest curriculum areas are history, art, civics and foreign language. One of the most glaring problems with the modern emphasis on standardized testing is how poorly it prepares children for the real world. In the age of the Internet, the ability to cram facts into your short-term memory is utterly irrelevant. The ability to synthesize is ever more important, but hard to demonstrate when filling out ovals. Collaboration is a critical skill to succeeding in the workplace, but oddly enough we call this “cheating” when done on an exam. Unfortunately, anxious parents have also come to believe in the importance of these test scores, and so even private schools are bowing to the pressure to report scores for these standardized tests. Today I am sorry to report that there is a growing movement of Montessorians who want to adopt the same standardized tests in private schools. Testing, with its emphasis on the extrinsic reward of a score, should have a limited place in a Montessori classroom. But some Montessorians believe that they need to employ these tests to demonstrate that their schools meet the same standards as public institutions. (Please note: Links go to articles discussing this trend, not organizations necessarily supporting it.) There is so much pressure to show that our students meet this standard that we risk forgetting that the standard itself is flawed, and only traditional drill-based methods could possibly attain it. Let’s remember, this is all because we don’t trust teachers to do their jobs. If we trust teachers, we can utilize better ways of measuring student performance. I know a charter school where the students are forced to take the same array of standardized tests. But fortunately at this middle school the administration encourages the teachers to endure these rather than obsess over them. Instead, the children use portfolio assessment. They accumulate evidence of learning for each subject area – which may indeed include tests. They can also be essays, photos of projects, posters, etc. The goal is for both the child and teacher to come to agreement on what has been learned. Administration can sit in on these meetings to gain insight into the school’s operation. For students to complete the eighth grade they must present their portfolios to a review board of administrators and local business leaders, something like a mini dissertation defense. I’m an odd duck in that I actually like tests, and have always tended to do fairly well on them. I am cynical about tests precisely because I often saw myself outscoring people who had worked harder and had a better grasp of the subject matter. 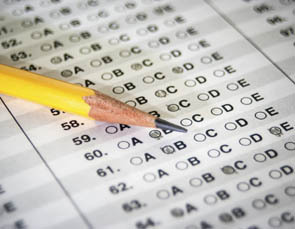 I am not speaking only of standardized tests – even written exams penalize the slow, thoughtful thinker and reward test-takers who are artful at cloaking their ignorance in cunning phrases. I thought it might be useful to list the things that testing can, and can’t do. Measure how good a child is at taking tests; for this is a skill that some are naturally better at, and which others can improve at with effort. Predict whether a child will be successful in the work place. This is my list, here’s a link for another. Testing is not inherently bad, and limited standardized tests are not inherently evil. The problem with testing children is that it is like measuring the size of a diamond by looking at only one facet. As Montessorians, we know there is more to human potential than what filled-in ovals can capture. I urge our community to remain steadfast in our belief that children’s abilities are much more complex, and much more fascinating, than can be measured by standardized test. And I urge all schools, including public schools, to trust the teachers. Trust them to teach, trust them to determine whether the children have been taught. Allow teachers to help children through the wonder of discovery rather than the peril of state curricula. If we empower teachers to do what they know best, to adapt to each child as an individual, who knows what heights our world might reach?